If you have a little magician in your family, we have the Magic and Illusion Toys you need to keep them entertaining the crowd. We have a selection of Magic Sets and all the accessories needed to keep the rabbits coming out of the hat. 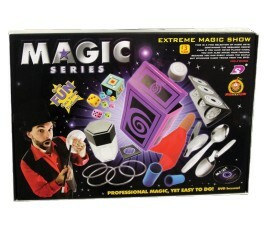 Buy your child's Magic and Illusion Toys online and let us help you keep the entertainment going for hours. Our discount prices are often better than the sale prices you find at other stores. We also offer shipping to your home that is magically fast and saves you time and money.